A Skeptic and a Seeker in conversation about matters of god, religion, morality, and other things that matter. Special guest Luis Dizon went from being one of the leading Protestant preachers to a member of the Catholic church. Find out what else is interesting about him. Dale is a guest on the "Ask an Atheist Anything" Podcast with hosts Andrew and Matt to probe when does the Atheist bear the burden of proof; topics range from discussing Bayes Theorem to the shifting of the burden of proof and the nature of defeaters (includes back and forth on Dale's critically acclaimed Molinistic Defeater). Dale does his best to make the traditional properties of god make sense. Consider this a preview to our upcoming shows on biblical violence which upcoming guests. Lydia McGrew stops by to school us on why she thinks the gospels were historical accounts. Class is in session. Does god speak directly to you? He speaks to this week's guest. This is the final part of my lecture series on Substance Dualism (i.e. the existence of the soul). Here we look at 4 skeptical arguments against the existence of the soul and evaluate 4 main physicalist theories of what the conscious subject entails. Drew is on the fence. Can Dale and David tip him one way or the other? What happens when Dale meets David Smalley in a surprise debate? Find out. This is Part 3 of series on Substance Dualism- here we address the second issue of contention of the Mind-Body Problem- proving the existence of a non-physical conscious subject. This is really a continuation of Part 3, the best of what Jesus had to say. David is all alone at S&S headquarters. And he goes completely off the chain for over an hour. Some people were never meant to go solo. David makes his second case for why he stopped caring about the bible, and why you should too. He tries to make the case that no one can really understand it. This is the second part of the series on substance dualism- here we assess the nature of mental properties and states (the first issue of contention of the Mind-Body Problem). David and Dale are in conversation with Gary Habermas: the dean of doubt. This is the first of 4 supplemental episodes on the nature and existence of the human soul (i.e. substance dualism); this will be an general introduction to the series and provide an explanation as to what the Christian position of substance dualism is about. Sarah, Andrew, and David take Justin and his guests to task on the subject of gender roles. Dale tries to make a case for god based on his attributes being logically possible. David makes a case for why the bible is not worth considering. Let's see how he does. Not exactly the most wonderful time of the year. Dale makes his final case on the basis of Daniel 9. David obliterates it in 15 minutes as promised. Or does he? Enjoy. Barrie Schwortz if the foremost expert on the shroud. And we have him for an interview. Dale and Andrew pepper him with audience questions. Barrie is gracious and informative. David even pops in for a question of his own. No matter what you think about the shroud, you will want to listen to this one. Dale attempts to make a non-standard case for the prophetic claims of the birth of Jesus. This is just Part 1. So it will take a couple of weeks to develop. In Parts 9 & 10 of our Shroud series, we shall be assessing the second major “Ordinary Artistic” mechanism- the Powder-Rubbing and/or Dusting technique. In this episode, we turn the tables and ask Dale the Questions, along with questions from the audience. David makes the case that there are key things about the spiritual war the Christian can never prove in a way that convinces a rational non-believer. David makes the case that Christianity is not just a cult, but occult. In Part 8, we finish our analysis of the traditional “Painting Hypothesis” as the image-forming mechanism of the Shroud of Turin (as advocated by Dr. Walter McCrone). I want you up front, this episode was not my favorite to do as it can get very technical at times (as is necessitated by the specific subject matter), so be aware this is heavier episode content wise and hence why I chose to separate this issue from Part 7 to be in a show by itself. Dale expresses real concern about how he and other Christians come across to nonbelievers. David explains how nonbelievers tend to hear Christians. David argues that there is no way for an outsider to identify a Christian. Find out if Dale can prove him wrong. In Part 7 we will take a look at the very first Shroud skeptical image-forming mechanism; the “Painting Hypothesis” as advocated for by Dr. Walter McCrone. Who is Tara and what does she believe? You're about to find out. Dale tries to argue that a prophecy of a miraculous event should be counted as double warrant for the G-belief event. Find out what that means, and if he is successful. David calls Dale a moral monster. Dale calls David a moral monster. Listen to discover why. In Part 6 we will spend the first half of the show to lay out and describe what it means for an event (i.e. the formation of the Shroud’s images and their associated Minimal Relevant Features or MRF’s) to be “Extraordinary” (aka. fulfill Criterion B.) as part of my case for the Shroud evidence constituting a “G-Belief Authenticating Event”. Instead of moving on to assess the first image-forming mechanism (The “Painting Hypothesis”) we shall turn to address some of the listener Feedback that I’ve gotten on my Shroud series thus far and my response to some of that. Did god cause the walls of Jericho to fall? Dale tries to make the case. In Part 5 of our Shroud study, we will finish off discussion of the final two “Minimal Relevant Features” (MRF’s) which will be used in evaluating the various image-forming mechanisms in Criterion B (upcoming Podcasts). This episode, we look at some of the various anatomical accuracies and bloodstain features present on the Shroud Man’s images, while also surveying 7 Additional “MRF’s”. In addition, we tackle various Skeptical Counter-features related to these features as well as overall Counter-facts. David makes a case for Jesus Mythicism. But it is not necessarily the case you are expecting. Does he have a point? Let's find out. Dale shifts his focus from the book to the show, asking questions that came up in the appearance un Unbelievable. We also take questions from the audience. This one is going to go long, really long. This one gets a little heated as Dale and David wrestle over... Well, you'll see. Dale continues the series with more dating evidence. Be sure to check out part 1 first. This kicks off a week of bonus material as a way of saying thank you to the listeners. Andrew, Matthew, David, and Dale get together to talk about David and Andrew’s appearance on Unbelievable. Matthew is one of the authors of the response book, “Still Unbelievable: why after listening to Christian arguments, we remain skeptics” reasonpress.net Dale agreed to be the official cat herder. As the resident (though not quite tamed) Christian, he had a few questions for the grilling. We rambled, we joked, we gave him a hard time. Then, we hit record. And it went downhill from there. Enjoy. This week, Randal and I were a part of a panel discussing two books, one of which was coauthored by yours truly. https://www.premierchristianradio.com/Shows/Saturday/Unbelievable/Episodes/Unbelievable-Can-Justin-defend-his-own-book-feat.-David-Johnson-Andrew-Knight-Randal-Rauser We got together since then and had a round two on a different topic. This is that conversation. David makes a case that the Fall fails as a doctrine, bringing with it other sacred doctrines like original sin and redemption. Under any form of theistic evolution, there is no room for the Fall. Dale calls for Christian participation on this one. Dale thinks the resurrection can prove Christianity, and only Christianity. Dale also thinks Christianity can borrow from Judaism in ways that other religions can't borrow from Christianity. Does he make his case? What should the Christian advise the skeptic to do if the skeptic comes to a conclusion that god is real, but evil? Let's find out. Dale rehabilitates his argument from last time (but not really). David is gracious (but not really). Even so, they both shook hands and agreed to disagree (but not really). No more Mr. nice guys. Dave and Dale argue for the best of their side and the worst of the other's. The discussion was so good, it couldn't be contained in one episode. So when you are done with this one, you can jump right into part 2. Enjoy. 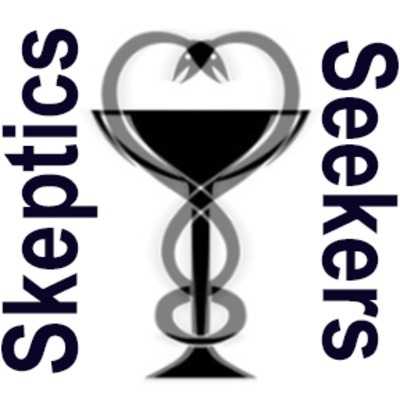 Both the skeptic and the seeker reveal the weakness in their own position, and the strengths in the other's.